In 1921, Frank McNally of Hammond, Indiana married his housekeeper. There was a significant age difference between the pair: Frank was 51, while his bride was only 26. But Frank really wanted a family, and he knew that he would be more likely to get one if he married a younger woman, though it was said that he truly did love Hazel. It seemed that Frank’s wishes would be fulfilled when Hazel announced her pregnancy not long after their marriage took place. Hazel was reportedly very careful during her pregnancy. She even insisted that she handle all her medical care herself, since she was a trained nurse. No one questioned her when she decided she wanted to deliver her child alone, without any help. Finally, the expected day arrived, and Hazel took to the couple’s bedroom to give birth. A few hours later, she presented her husband with twins, a boy and a girl. Frank was ecstatic that he was now a father, but his joy was tempered by some unexpected news from Hazel. Due to her medical training, she was able to detect that both babies had a severe medical condition. She told Frank they were weak and fragile and that their eyes could not handle being exposed to the sun. Therefore, they would need to be kept in a dark room as much as possible, and when they left the house they had to wear cloths over their faces to protect their delicate eyes. Hazel would not let Frank do anything for the twins, and she would not let friends or neighbors near them. When Hazel left them napping one day while she went out to run errands, a curious neighbor crept into their nursery to catch a glimpse of the mysteriously ill infants. 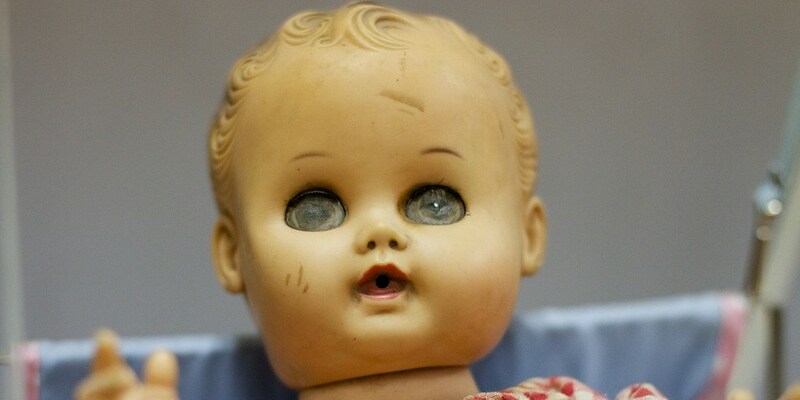 This woman, to her horror, found two porcelain dolls lying in cribs. There were no real babies to be found. Frightened, she ran to tell Frank what she had found. When Hazel returned home, Frank confronted her, and she confessed that she had never been pregnant. The “babies” had always been dolls. Frank had been so deceived that he suspected Hazel was lying and that she had killed the children when she ostensibly took them to Chicago a few months earlier for specialized medical treatment. He called the police and accused her of murder. Hazel admitted to the police that she had known she was sterile, but that she wanted to please her husband. For this reason, she faked her pregnancy and the birth of the twins. Not knowing how to handle such a strange case, the police kept Hazel in custody while they sought witnesses. She was put on trial for murder in 1922. During the trial, a nurse who visited the McNally home said that Hazel would not even let her see the twins but that she had seen Hazel appear to nurse them. Various neighbors and acquaintances testified to having seen the babies alive, while others said the opposite. At one point, Hazel even said that Frank was in on the hoax and that he insisted that they exhibit the dolls as their own children until they could adopt real ones. Since there were no bodies and no confession, and no one could prove definitively that Hazel had even ever been pregnant, the judge acquitted her. After the trial, Hazel announced her intention to buy two more dolls and to attend law school. Inevitably, the couple divorced, but Frank insisted until the day he died that the twins had been real.